This comprehensive research study on the global buckwheat market provides valuable insights on the global market for buckwheat including information on the changing dynamics of the market in the present scenario as well as few years down the line. Global buckwheat market research study focuses on various opportunities, trends, drivers and restraints across key geographies in the globe. This delivers a global perspective by covering all the key areas presenting a holistic view of the market. This assists the reader to get a detailed understanding about the regions with optimum potential in order to slate investment decisions and expansion strategies. The research study eliminates all the biasness giving a more realistic shape to the market acumen. Credibility of the researched data and statistics lie in the uniqueness of the research methodology which ensures higher accuracy. In-depth assessment of the global buckwheat market is underpinned by an extensive research process that includes both secondary and primary research to obtain relevant numbers. The data collected undergoes several funnels of validation and re-examination at each step, as the research progresses. This ensures delivering value with data having higher degree of accuracy. The expert opinions of the market observers and the domain experts is extrapolated and triangulation of these enables the analysts to arrive at a much accurate global market representation. The report on the global buckwheat market involves a separate section that focuses on key players and the competition standing in the global market. The section involves the strategies applied by the key players, their product portfolios, their innovations, developments and product evolutions, their area wise spread and future expansion plans, the mergers and acquisitions taken place, the market shares and revenues of these tier players, financials, key personnel, etc. This intelligence dashboard completes with the inclusion of the analysis of the various aspects of the key competition in the market. Competitive assessment has been done in a systematic way to enable the reader to draw necessary conclusions. The comprehensive research report on global buckwheat market provides valuable insights with weighted analysis. Every organization has its own integral research team, which strives to gather sufficient research data of the market. Persistence Market Research aims at doing all the heavy lifting by providing unbiased insights which can be actioned by the research team thus supporting in achieving their research milestones. According to this research report, the global buckwheat market is anticipated to grow at a moderate rate to reach a significant value by the end of the year of assessment. The buckwheat market has been experiencing steady growth during the 2012-2016 timeline. It is projected to grow at a value CAGR of 4.2% throughout the period of assessment, to reach a market value of around US$ 1.8 Bn by end of 2027 from a market valuation of about US$ 1.1 Bn in 2017. The research study portrays a complete picture of the global market for buckwheat and covers forecast analysis for a period of 10 years, starting from 2017 till 2027. Aspects such as increasing consumption of buckwheat in food and beverage sector, increasing innovations in food resulting in rising consumption of buckwheat, increasing consumer focus towards organic food and increasing need for gluten free products are expected to fuel the growth of the global market for buckwheat. Moreover, the “on-the-go consumption” pattern is increasing the traction of RTC (ready to cook) /RTE (ready to eat) healthy meals in the food industry. Multigrain wheat products are also witnessing rising demand due to the presence of multiple nutrients in a single diet. For instance, in the United States, buckwheat is gaining popularity in healthy diets and side dishes. Buckwheat, a highly nutritious product, requires very less cooking time, and no chemicals for processing. Thus, it becomes very compelling among health conscious consumers. There are several end use areas of buckwheat, namely, food and beverage sector, animal feed industry and cosmetics and personal care sector. 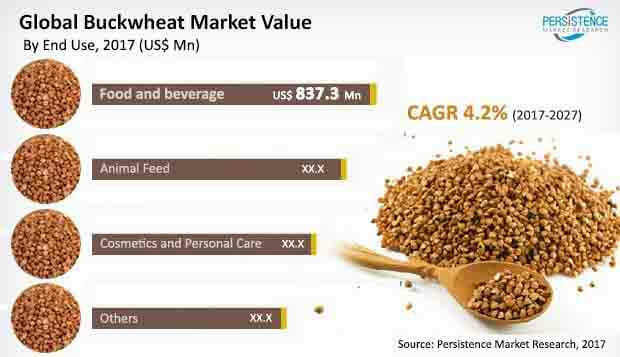 The food and beverage industry is expected to showcase high consumption of buckwheat as compared to other end use segments. The food and beverage segment is estimated to reach an estimate high than US$ 1 Bn by the end of the year of assessment. In addition, the food and beverage segment is expected to grow at a comparatively high value CAGR throughout the period of assessment. The application of buckwheat in the food and beverage sector is mainly into snacks, beverages and bakery products. Of these, the consumption or adoption of buckwheat in snacks is growing at a significant pace and expected to largely contribute to the growth of the parent industry. The snacks sub segment is poised to grow at a high value CAGR throughout the period of assessment and is estimated to touch a market valuation of more than US$ 485 Mn by the end of the year of assessment, thus pushing the growth of the parent segment. The use of buckwheat is also observed to reflect a potential growth trajectory in several bakery products. The bakery products sub segment is the second largest with respect to market value and attractiveness. Snacks and bakery products sub segments are expected to reflect high lucrativeness in global buckwheat market in the years to follow. Animal feed, one of the end use segments, is anticipated to grow at a substantial rate and reflect high market value by 2027 end. The animal feed segment is projected to expand at a CAGR of 3.7% throughout the forecast period to reach an estimate a little under US$ 400 Mn by the end of the year of assessment (2027). Skvyrskyi grain processing factory Ltd.